The Castlemaine Historical Society is taking part in the National Trust Australian Heritage Festival by hosting an exhibition titled Business, Bunfights & Brawls at the former courthouse in Goldsmith Crescent, Castlemaine. 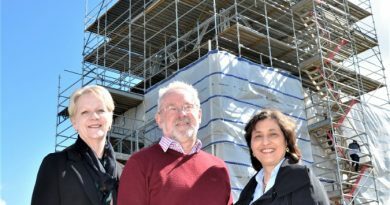 The exhibition will highlight the atmosphere of the Mount Alexander Goldfields when Local Government began in 1855. The stories of the Local Government’s establishment, the personalities and the events that took place will all feature. On Saturday May 4 at 10am Mount Alexander Shire Councilor Max Lesser’s “Councilor Peg” project will be launched at the exhibition. The aim of Max’s project is to inform school students about the role of local government in their community. All are invited to attend especially school students, accompanied by adults. The exhibition will be open at the Former Court House, 7 Goldsmith Crescent, Castlemaine, on these Tuesdays: April 23 and 30 and May 7 and 14 from 9am-3pm. It will also be open on Saturday and Sunday May 4 and 5, 10am-3pm. Free event. 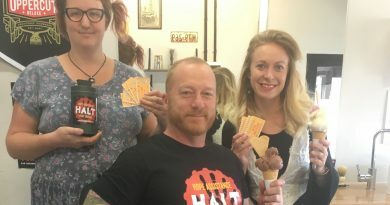 Icecream Social's Rosie Annear, Jeremy Forbes of HALT and Gemma Archer of The Maine Barber celebrate their sweet new partnership.